Guests will be able to set out, during their stay at the farm, on a variety of long walks and easy strolls on the hills surrounding the farm, along well-signed trekking-tracks, cycle around the woods or lose themselves in the magic of charming nearby towns such as Cortona, Lucignano, Monte Riggioni, Spello and many less known but equally fascinating villages and hamlets. Here restaurants and taverns are a compulsory stop for all gourmets and you will be able to relish dishes cooked like they used to be in the good ole days. Home-made cooking holds sway in our farm. Celiacs have a special place at our table and will be able to enjoy stress-free dinners as the owner, a celiac herself, will make sure all their meals are prepared with absolutely gluten-free ingredients. 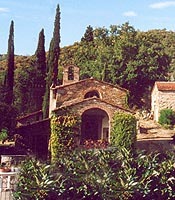 Within the property a small chapel will provide the perfect spot for ceremonies and weddings. All year round many events spice up the local cultural and recreational scene: not to be missed, in Castiglion Fiorentino, in the Easter period, the charming procession floats and the bi-annual Passion of the Christ re-enactment. 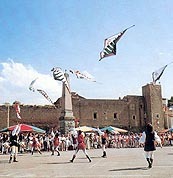 On the third Sunday of June takes place, in the large Piazza Garibaldi, the Palio dei Rioni, accompanied by costume parades and the wonderful show offered by the sbandieratori (flag-throwers). In Decenber, finally, the whole town turns into a huge living nativity scene and each corner and each alley takes on particular charm. Concerts and folklore shows add sizzle to the evenings in the Agriturismi of the Val di Chio and guests may taste on such occasions local products from the various farmhouses. In Arezzo, on the first Sunday of the month, you may visit the Antique Fair, one of the most valued in Italy. Also worth seeing in the nearby towns: the Archidado (cross-bow competion) and Umbria Jazz Concerts in Cortona, the Maggiolata in Lucignano (20 Km), the Giostra del Saracino in Arezzo and the Carnival Floats of Foiano (20 Km). In Castiglion Fiorentino you may find: the olympic-size pool, the Serristori flight centre and several riding centres. In the nearby lake Trasimeno you may visit the charming islands and practice watersports.